"I adapted this from a turkey burger recipe when I went vegan. It is also gluten-free if you use gluten-free soy sauce. I use it as a post-workout meal, as it is delicious, satisfying and relatively high in plant-based protein. Enjoy!" Bring water, quinoa, and vegetable bouillon to a boil in a large pot; stir in edamame, cover, and simmer until quinoa is tender, 15 to 20 minutes. Heat olive oil in a large skillet over medium heat; cook and stir onions and bell peppers until onions are translucent, about 5 minutes. Add ginger and garlic; cook and stir until fragrant, about 2 minutes. Remove from heat; stir in soy sauce, cilantro, and chile paste. Stir onion mixture into quinoa mixture; simmer, stirring occasionally, until excess broth has been absorbed, about 5 minutes. This can be served immediately or refrigerated for up to 1 week and reheated. I buy frozen shelled edamame in packets from Trader Joe's®. Flavor was just ok and the edamame didn't flow well with the texture of the dish. 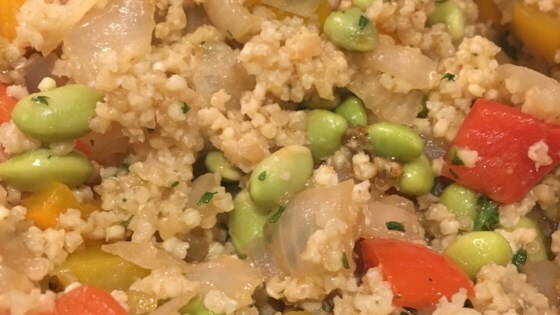 Very easy to make, packed SO MUCH more flavor than a lot of quinoa recipes, and even got rave reviews from meat eaters:). It was also excellent the next day for leftovers. My family LOVED this healthy recipe.